As Brook padded off, twilight came up and joined her on her right flank. Brook glanced at twilight, taking in her nervous & submissive body language. 'Why is she so nervous', Brook stopped and took another look at twilight, this time she realised she was shaking. "Why are you so nervous" Brook said in a sweet tone, "W .. well you're so much bigger than me and a lot stronger i'm guessing". "Me stronger than you, i could barely even manage being a healer if i were in a pack" Brook said with a smirk. " Well ok, we should probably get going or we'll be walking all night". As the two slim wolves started heaving themselves up the hill, a warm scent trickled up Brooks nose, "Hares!" Brook whispered in an excited tone. Both Brook and twilight stopped right in there tracks, listening and feeling for any kind of sound or vibration. Soon after Brook spotted a little white ear pointing up, she slowly stalked up to it showing off her best skills to twilight. When she was only one meter away Brook leaped, but she twisted in the air and landed way off. The hare spotted in midair her and bolted into a nearby den, so brook ended up only scaring a few birds. "Great!" Addressed:Twilight Mentioned:Twilight Notes: Nice hunting skills Brook! "I need some space, I'll be back soon.." she had sounded a little off put before turning her curvaceous physique. Azrael watched as the obsidian beau left the scene, heading into the thickening evergreens. He had seen the beckoning look within her glazed optics, she wanted him to follow. Tilting his cranium back towards the collection of lupus, his optics scanned their expressions, Lupa had been scared off by the number of wolves perhaps, maybe only that brute of a beta. Decidedly, he wished to follow but he'd have to get some information first. "So, Alpha, of which direction should i head to find the pack quarters? It would be useful for my friend and I when we cease to roam these slopes, you know, so we can locate our new home for the moment." though not as polite as before, the baritone voice of Azrael projected over each wolf's breath intake, exhale and movements. instead of waiting for an answer he quickly made an alter to his statement "Don't worry, I'll follow the scents." He dipped his cranium to the Alpha before turning to the beta and doing the same action, suppressing a rude glint to appear in his hazel optics. Turning on his fore-paw, he bid them goodbye, following the light track left behind by the ebony beau. - Bold is someone else's speech. - Italic is Azrael's thoughts. - Black is Azrael's speech. Lupa watched as the ebony male that addressed her as beau, Azrael, came through the trees toward her. She sat there, waiting for him to be closer before dipping her head towards him in respect. Why was she even doing this? Why was she talking to him anyway? Lupa didn't even know what was going on with her emotions, it was weird but she went with it. "I... I'm... I'm so sorry for putting you in the spot back there..." She said, her voice showing her obvious confusion with what was going on. "I don't know what's going on but I don't feel myself. I couldn't stay there any longer, not because I was scared but because talking to you felt weird. I alo didn't mean to say you're.... handsome...."
Lupa then looked at him, his wonderfully carved out body, his beautiful eyes stood out to her, something she'd never noticed in any wolf before. She didn't know why but she felt the urge to say something to him, something she never thought she'd say in her whole life. "But it is true, you are extremely handsome." She said. Her face showing she meant it but Lupa thought she shouldn't of said it. Maybe it was all a mistake. He came padding towards her, his cranium lowered to a more easily held position. He weaved through the evergreens with a shown ease, tilting his shoulders towards the ground at a slight angle. Every so often the lower branches would brush against his sides or back leaving a subtle trail of snow clinging to his pelt. He moved up to the side of his ebony beau with ears flicking towards the direction the faes vocals amplified from, he listened into to what she had to say. "I... I'm... I'm so sorry for putting you in the spot back there...", she sounded confused about what she was doing and this made the inkling of confusion latch onto himself. "I don't know what's going on but I don't feel myself. I couldn't stay there any longer, not because I was scared but because talking to you felt weird. I alo didn't mean to say you're.... handsome...." He watched as she looked up, concern showing through his barrier in both his eyes, and his body language. She was scanning over his frame but something wouldn't allow her to move from his optics, her jowl dropping as if she were about to say something before it came out, that one sentence he'd been hoping she'd say. "But it is true, you are extremely handsome.". He stood there with a slight smile growing at the corner of his jowls. What a fine sentence indeed he thought to his advantage, it was a compliment of all compliments. Azrael watched as her expression changed slightly, as if she'd regretted saying it all; He need to say something that would change her mind. "And you Lu... Are as beautiful as they come. You have the smoothest of ebony pelts I have every seen in all my years." His grin was genuine and exceeded in reaching the corners of his optics. "Come on now, lets get out of this stupid forest so we can talk in a more private area" He looked back at the ebony beau and signalled for her to follow him as he began to pad off through the trees towards the valley he had recently crossed. Lupa could see the smile that began to grow in his mouth, he liked her complimenting him, she could tell. She attempted to stop looking into his eyes but she was lost before now, they seemed to guide her, he guided her. But not in the way she wanted, she wanted to stay aggressive but she could see in his eyes he didn't like aggression at all, not one bit. The ebony femme knew she couldn't hide it forever, her aggression would come out sooner or later and he'd see the true Lupa, the aggressive one, the true warrior. The one she hides away under a sweet facade. "And you Lu... Are as beautiful as they come. You have the smoothest of ebony pelts I have every seen in all my years." He said, just as Lupa began to regret calling the sweet male handsome. But Lupa noticed something, he didn't call her Lupa. Lu. He called her Lu. Lupa had always pretended to everyone she hated it, yelled at them, fought against them because of it, but this time she didn't - she just felt an urge to pull toward towards him. Lupa pulled her body over towards him and snuggled her head into his broad chest. He gave her so many complements that just made her have a funny 'buzz' in her stomach, she didn't know what that meant at all but she went with it because she was enjoying snuggling into him. Lupa loved physical affection quite a lot, just snuggling into her slightly made her feel better, but not just by anyone. He made her feel welcome when he complemented her. Saying her pelt was smooth and soft with such a genuine expression was nice to hear and it smothered her ears for a moment as she listened to him exhale and inhale. "Come on now, lets get out of this stupid forest so we can talk in a more private area." His voice woke her from her thoughts. 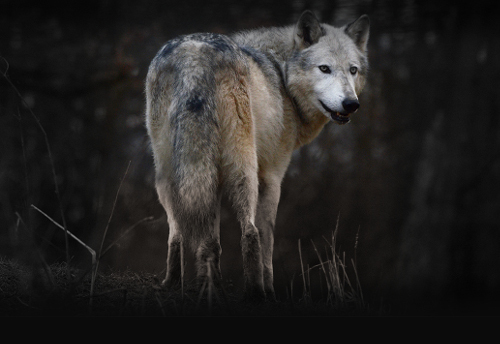 Lupa pulled back from his chest and looked up at him with a nod. "Yes, good idea. Lead the way, I'll follow you. I'm sure you'll take us to somewhere wonderfully fitting, you seem clever enough to know I'll like this place you are taking me." She said. That was probably her best attempt at complementing him other than just calling him straight out handsome, she wasn't very good at complementing anyone at all. She never had been. Lupa knew she needed to confess her true personality to him, but that only made her sad, she really felt safe around him but her longing to be wild made her feel as though he deserved to know, he deserved her truths. She'd have to confess before it was shown, she needed him to know before her aggression got the better of her. Lupa followed the handsome young male to wherever they were going willingly as he beckoned her to follow, she was quite happy going with him, after all he knew where he was going by the looks of things. The femme still couldn't get his complements out of her head they just sat there like lillypads on a pond. Lupa felt the need to say something as they walked, it was needed after all, so she sped up to walk alongside him, their fur touching. She could feel the heat from his body once more but ignored it and just spoke. "So, Azrael, where are we going?" Addressed: Azrael Mentioned: Azrael Word count: 587 Notes: OMG LUPA WHY YOU DO THIS? She's so confused like wow. Ice crouched over his father Shadow, the wolf had a bullet hole in his chest. Ice collapsed next to the 4 year old wolf. It was troubling times. He looked around at his siblings, Sand, Ash, Night, where the eldest with him, the yearlings where shocked to see there father a noble wolf dying at their paws. The yearlings are Snow, Dust, Amethyst, and Creek. "Take care of mom..." Ice said. "Your leaving us...?" Ash said astonished. "yes...." Ice said his vision blurry with tears. Amethyst looked at him with her big amethyst eyes. "It's my fault he's dead I killed him, I killed our father!" Ice said tears streaming down this snowy like face. Without any answer Ice ran into the snowy woods. slipping on ice and sliding down the he howled for help but his pack was too far away to hear him. he thought he heard a wolf nearby he crashed into a tree the braches gave way and fell on him he blacked out. Ice looked around he was loner now. He lifted himself from the snow and branches. Ice sniffed the air. Definatly a pack around here. he howled it split the air.he had run from the creek far from the slopes to here. he saw three wolf not far from him he bounded over diping his head. Cherokee looked at the crowd of wolves. She sighed as two of them had decided to get up and leave. Though she could tell the one by the name of Lupa was getting a bit anxious anyways, so she didn't care much. She understood the need for company, so she didn't mind that Azrael followed her either. She looked back to the rest of the wolves that were in the area. "If you are interested in staying here, follow me. We will head back to the den where we can talk in quiet. The rest of you I suggest leave the territory before the guards come and kick you out. This is our home after all..."
N O T E S: If you follow Cherokee you can head over to this thread. I will wait for people to finish up their posts here then I will be locking this. "Good job Brook" twilight smirked, "That hare heard you coming from a mile away". 'Let's get going, i think those wolves up ahead are on the move' said Brook in a serious yet soft tone. The two wolves made their way up the steep snow covered hill, their legs heaving and pads freezing. Notes- Twilight and Brook will follow the pack to the main den, and we will start Rping there.